Candles were made in 3000 BC by the Egyptians from melted animal fat and beeswax. Today, most candles are made out of waxes like paraffin, soy, and palm. These illuminations are simple and relaxing objects that we are naturally drawn to. The floral, herbal, and other alluring scents that candles provide calm us down and can even bring back strong memories of the past. The flickering of the flame also draws us in and provides a unique ambiance, while the comforting soft glow gives us a sense of charm and ease. While many of us set up candles around our bathtub for a relaxing bubble bath, some of us just want them to float around romantically. For once, you can actually make fire and water mix—with floating candles. Plus, with these, the movement of the flame is amplified and increased by the motion in the water. Wax: You can use a votive blend. Whatever you choose, make sure it can stand up by itself, like a votive or a pillar blend wax. Wick: Use an untabbed zinc core wick that's suitable for a 1 to 2-inch candle. Fragrance: If you want your candles to have a scent, use a fragrance or essential oil as desired. Color: This is optional, but you can color your wax if you want. A Small Mold: Ensure that the mold is larger at the top than it is on the bottom. Many candle supply companies sell "tart" or "floater" molds. You can also use a mini-muffin tray here. Basic Candle Making Instructions: Review how to make a candle before going on to make a floating one. Let the candles cool until there's a skin over the top. Then, take a small piece of primed wick and gently stick it upright into the center of the candle. However, you don't want it to go all the way through the bottom. The process is similar to the wick testing trick, but you have to leave the wick embedded in the wax. After you've inserted all of the wicks, let the candles cool. When they're cooled off, pop them out of the mold and trim the wicks to about 1/4 inch. Then, your candles are finished. One idea is to drop a floating candle into a glass. You could also use a wine glass, goblet, or margarita glass. Depending on the size of the glass, it may fit several small floating candles. This is a great idea for parties. Fill a votive (or small candle holder) with water to make a floating candle votive. You can put these on your dinner table, mantle, or outside on the porch. You don't have to get fancy to use floating candles. 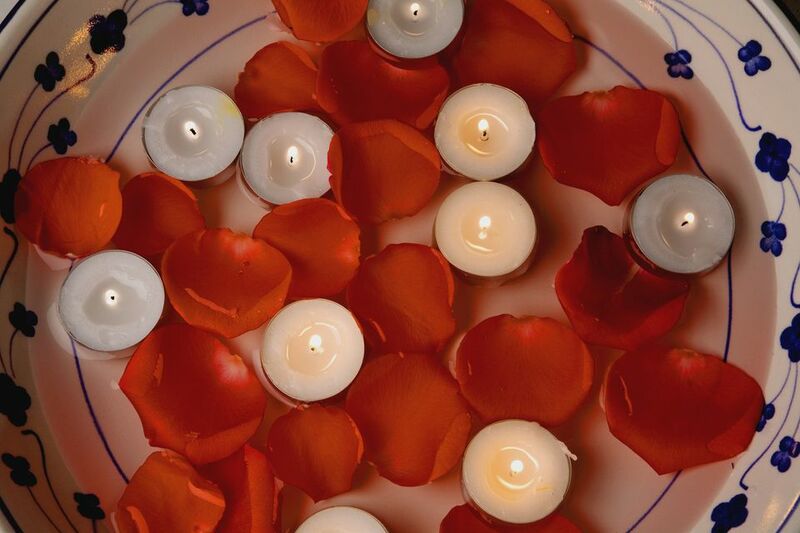 Simply fill a large bowl with water and place several floating candles in it to make a warm and beautiful centerpiece.